For many days now I have been waiting for the light. I want to take pictures of the things I am cooking and baking during this holiday season so I can share them here. Unfortunately, the Midwest has been under a dense blanket of clouds for a long time…with only an intermittent peek or two, at odd hours, of the sun. I am always sensitive to the diminished light as we approach the Winter Solstice, but even more so since I began keeping a food blog. Without the aid of bright light out of doors….or harsh indoor lighting (inappropriate for pictures)….my kitchen is a fairly dark place. The unrelenting cloud cover has only made it worse. Unfortunately the forecasters are predicting more of the same. So, instead of working on a new recipe….that I might or might not be able to capture with my camera….I am going to share a recipe we enjoyed last fall, when my kitchen was still full of light (during the middle of the day, at least). The ingredients—winter squash, mushrooms and apples—are still in season now…and the flavors are warm and bright. Perfect food for a chilly, gray day. 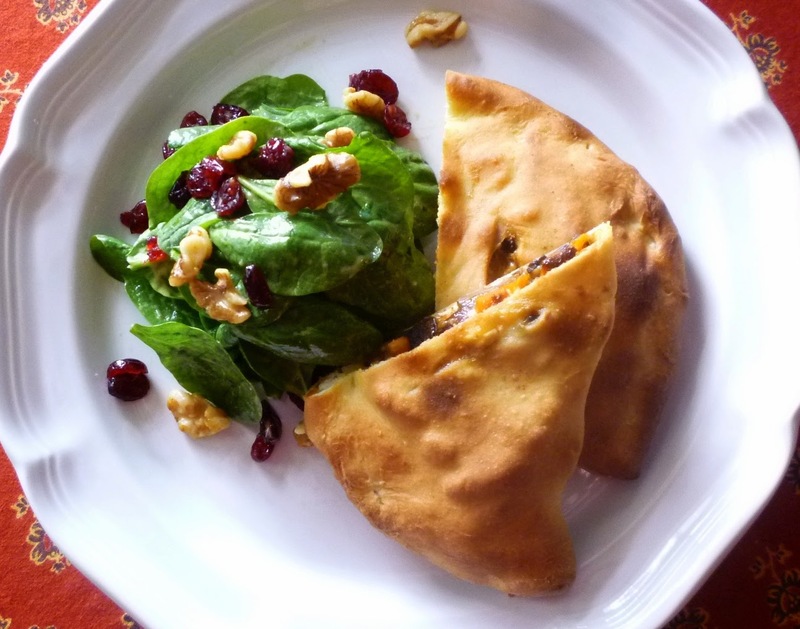 The posting of this recipe is in fact fairly timely: Calzones are just the thing for this oh-so-busy time of year. They can be made ahead and are a great thing to have on hand to reheat and serve a hungry guest…or yourself, at the end of a long day. They are of course delicious when freshly made, but I find I actually prefer them when they are reheated. Whereas the pizza dough shell is soft and chewy the first time around, it becomes crisp upon reheat. I suppose your preference will closely mirror the way you feel about thick versus thin crust pizza. 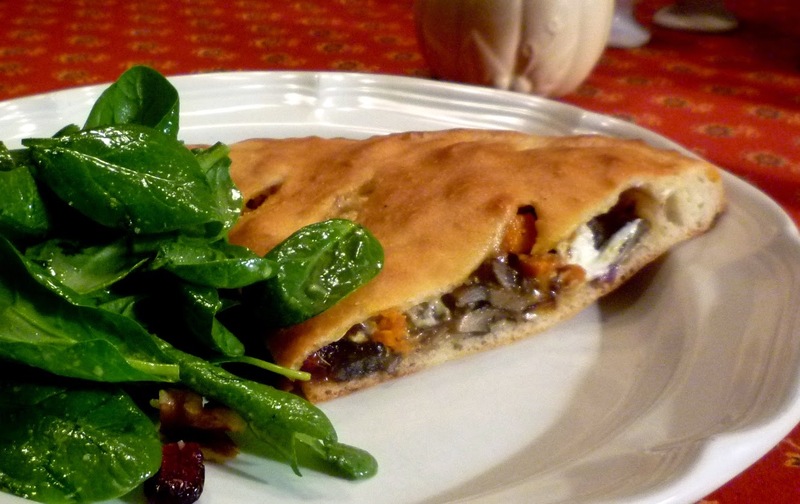 To reheat, simply place the calzone directly on a preheated baking stone in a 350­­° to 400° oven. It will be hot through in a few minutes…about the length of time it takes to set the table and dress some greens for a simple salad. Hopefully the forecasters will be proven wrong, and the sun will return soon. But even if they are right, for now the grayness only serves to enhance the beauty of this holiday season of lights. And I take comfort in this: Today is the shortest day of the year. Tomorrow we will begin the annual march toward the bright light of the longer days ahead. Make the dough: Place the water in a small bowl, sprinkle the yeast over and whisk in. Let sit until the yeast has dissolved. Place the flour and salt in the food processor fitted with the metal blade and pulse to blend. Add the oil and yeast/water mixture and pulse until the dough is homogenous. Begin to run the mixture in long pulses until the dough is smooth and elastic—about 15 to 30 seconds total processing time. If the dough seems wet and sticky, sprinkle in a bit more flour, a tablespoon at a time, pulsing after each addition. Turn the dough out onto a lightly floured counter and give it a few kneads by hand. Transfer the dough to a lightly oiled bowl and cover the bowl with plastic wrap. Let the dough rise until it has doubled in size—about 1 hour. Punch down the dough and turn it onto a lightly floured surface. Divide the dough into two to four pieces and roll into balls. Cover with a towel and let rest for 15 to 20 minutes. The dough is now ready to be formed into calzones. While the dough is rising, prepare the filling. Toss the squash, onion & apples with 1 1/2 tablespoons of the olive oil. Season with salt and pepper and spread on a small baking sheet—the vegetables should fit the pan in a snug single layer. Place in a 400° oven and roast until tender and nicely caramelized—about 40 to 50 minutes. When the vegetables begin to brown, start turning them occasionally. Watch very carefully during the last 5 to 10 minutes of roasting to make sure they don’t burn. Set aside to cool. Heat a non-stick sauté pan over medium-high to high heat. Add oil to coat the pan—about a tablespoon, then add the mushrooms. Cook, shaking the pan occasionally, until the mushrooms are browned, tender and any liquid that they have given off has evaporated. Remove the pan from the heat and add the prosciutto, tossing to combine. Scrape the contents of the pan into a large bowl. 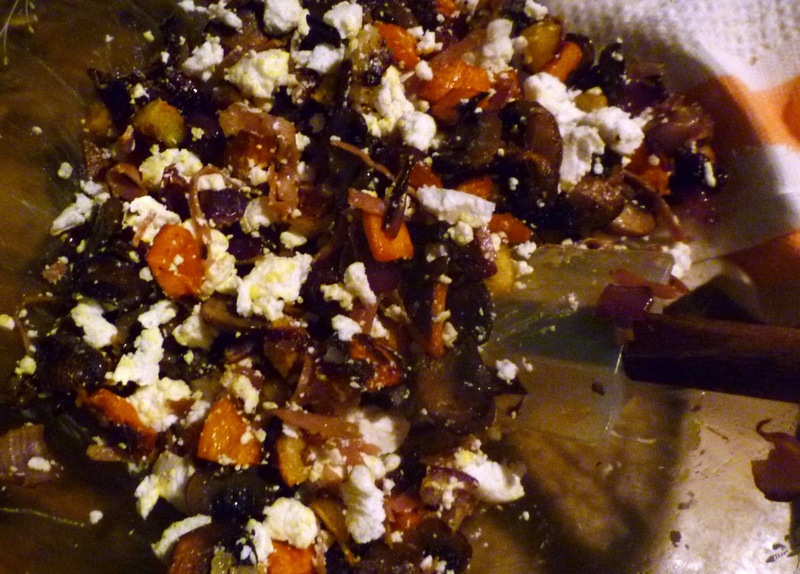 When ready to make the filling, add the roasted vegetables to the bowl with the mushrooms and toss to distribute. Add the cheeses and toss again. Taste and correct the seasoning. Build the calzones: Working with one ball of dough at a time, roll the dough out into a round. 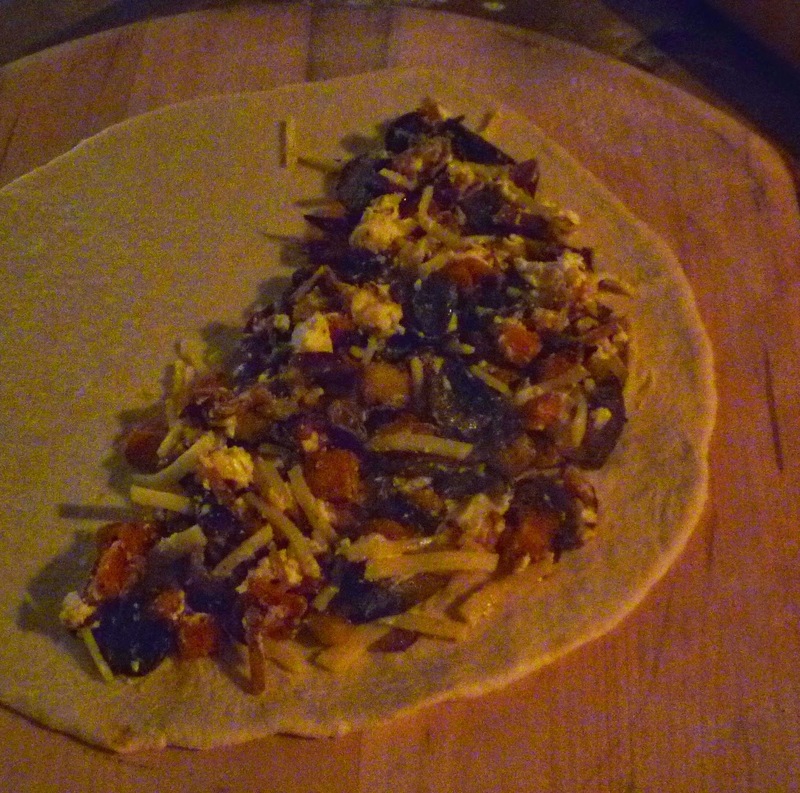 If making 2 calzones, roll the dough into 12-inch rounds, if making four, 8-inch. Place half (or a quarter) of the filling on one side of the round, leaving a half to one inch border at the edge. Moisten the bare edge with a bit of water, fold the other half of the dough over so that the edges meet. Roll and pinch the seam to form sort of a running crimped edge that is well-sealed. Slash the top with a sharp knife two or three times. 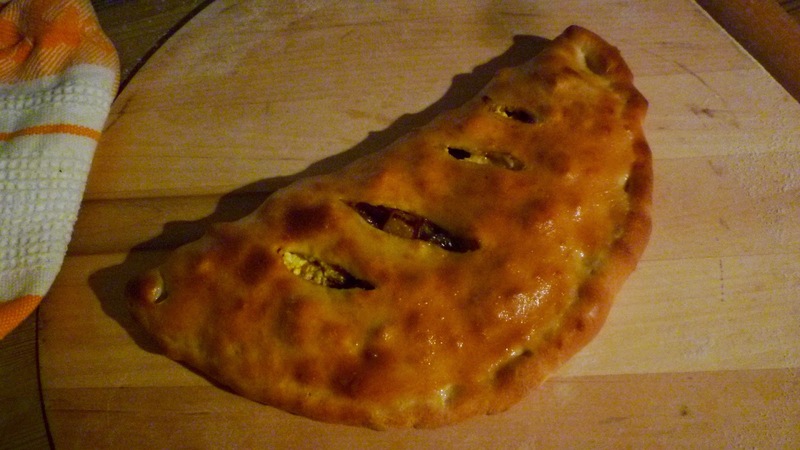 Place the formed calzone onto a floured paddle and slide onto a preheated stone in a 500° oven. Repeat with the remaining dough and filling, baking them as you fill them…or baking them all at once if your stone is large enough to handle them all at once. Bake until well browned--about 12 to 15 minutes. Transfer to a wire rack and brush the surface with olive oil. Recipe serves 4. 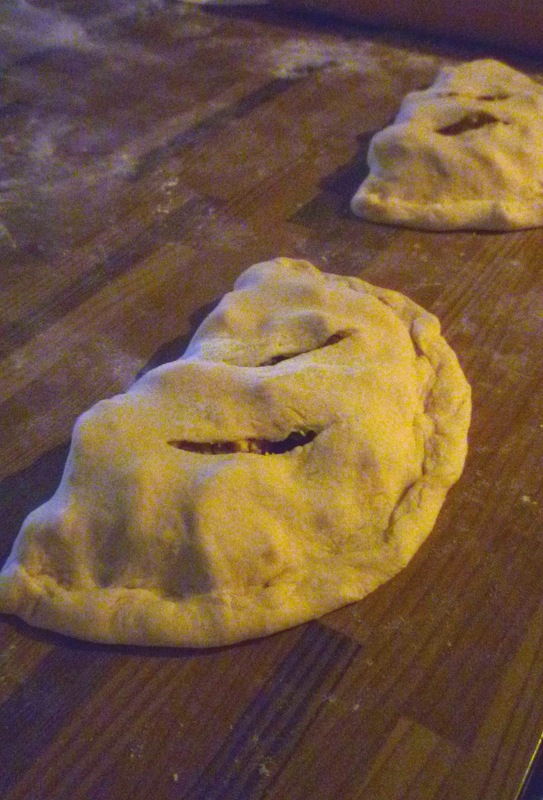 If you have formed two large calzones, cut in each in half with a serrated knife to make each into 2 portions. Add a minced clove of garlic, a pinch of pepper flakes, and/or a half teaspoon of minced fresh rosemary with the prosciutto. Substitute Fontina or Low-moisture Mozzarella for the Provolone. This looks amazing. Your blog is amazing as well. Thanks Tim! So glad you enjoy it. I made these this weekend and they were incredible! The recipe is very flexible - I used leftover Christmas ham and whatever cheeses I had on hand and it worked out just fine. I especially enjoyed your addition of apple. I also made your nut brittle as Christmas gifts and love your cherry kuchen recipe. Keep 'em coming! Love your blog. Hi Renee, I love your use of Christmas ham in the calzone! And I agree with you about the flexibility of the filling. I didn't mention it in the post, but I had intended to make these with goat cheese and ricotta...but when I opened my new container of ricotta, it had gone off!...so I had to make a last minute substitution. As it turned out, I liked the provolone better than the ricotta. I'm so pleased that you enjoyed them too. And I'm so glad to hear you tried the brittle and the kuchen. Thanks for taking the time to let me know!